Since we moved to Indy, we started a tradition of going to the State Fair. It's only 20 minutes from our house and with all the animals, it's fun to explore on a weeknight when it's less crowded and hot. I love the State Fair because I never went to Fairs growing up in California. Last year, we took Ava when she was only about 5 months old and she loved it! This year, she was more tentative of the animals. We took her through the animal barns and she got to see horses, sheep, goats, pigs, and cattle up close! 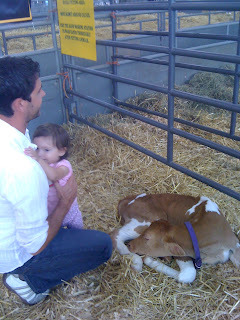 Aaron tried to get Ava to pet the sweet sleeping calf, but Ava was too afraid. She didn't mind the sheep or goats, probably because of their smaller size. The horses scared her quite a bit when we tried to get her to touch them through their cages. I'm surprised by how close you can get to the animals. Heading home after a fun night! We shared a buttery ear of corn and slices of pizza for dinner. And for dessert, we shared an elephant ear with cinnamon sugar. You can guess that Ava loved it! 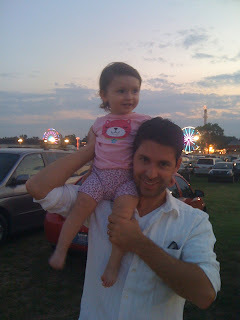 We decided against taking her in a stroller for more freedom to move around the Fair. She likes riding in the baby carrier or on Dad's shoulder! Sadly, we parked right by the site of the stage collapse that happened just days before our visit. That was sad to think about the horrific accident. They kept the stage in tact due to their investigation. It was eerie to be there only a few days after the accident, but we were glad to take advantage of the Fair since it's only once a year. During our visit, we stopped by the Lactation Station to nurse and I was happy to see that it was very busy. 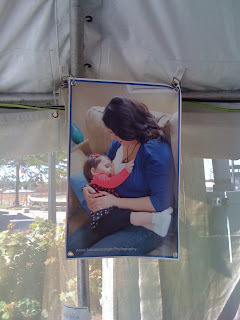 There were three other moms and baby pairs using the Lactation Station while we were there. Ava felt refreshed after a short nursing session and then we met up with Aaron for one last walk through the Fair before we headed back to our car. At the Fair this year, our nursing picture was featured in the main Lactation Station. We posed for the photos in April and they will use them across the State of Indiana for breastfeeding awareness and education programs. 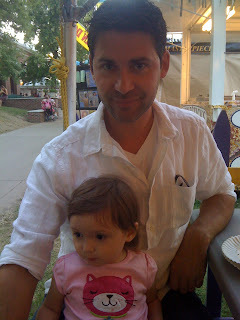 Enjoying the State Fair is a fun family tradition to look forward to every August. It will be fun to see what Ava enjoys next year!